"Dr. Mannering is beyond words in how well she has taken care of our son (since he was 6 months old, and 2 3/4 now). She listens and takes time with the patients. She comes in and I have never seen her not smiling. She interacts with our son and they will just sit there chatting away for ages. She is encouraging and level headed. Very well versed and informed. I would literally trust my child with her for anything. If there were 6 Stars, she would get it." The goal of vision testing is to identify and treat vision problems as early as possible. Up until now, we have relied on the doctor’s exam and the parents’ observations to diagnose an issue. Pediatricians and parents are sometimes able to recognize a vision problem, but often we don’t discover it until the preschool/kindergarten well visit when children are capable of being tested by the traditional eye chart. Over the past decade, we have experienced a huge advance in vision testing for young children. We are now able to identify and treat significant issues in children as young as 12 months of age that would otherwise not be detected until at least age 4. The newer technologies used to diagnose vision problems in young children are expensive and may not be covered by your insurance. So that these tests are available to everyone, we offer them for a reasonable cash price regardless of insurance coverage. Forest Lane Pediatrics has recommended a systematic schedule to have these screenings done. Like any screening exam, these tests are intended to be sensitive enough to detect any problem, but will sometimes result in a “false positive”. In other words, if your child’s test is abnormal, that does not mean he or she is blind or needs glasses or other treatment. We will refer you to an ophthalmologist (an eye doctor) who will examine your child and provide a more complete diagnosis. Whether or not you choose to utilize these optional vision tests, your doctor will always conduct a thorough examination of your child’s eyes at each well visit. 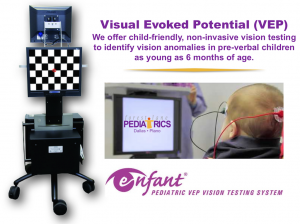 The Pediatric VEP Vision Testing System is a child-friendly, non-invasive medical device used to test for visual deficits and visual nerve pathway developmental delays in children six months of age and older. This machine is similar to the hearing test your baby had in the hospital. It measures brainwaves in the vision center of the brain as the child views images on a computer screen. The test will take about 10 minutes and requires us to apply sticky pad connected to small cables on the back of your baby’s head. If we cannot obtain an adequate test, we will not charge for the test. Though it cannot diagnose the specifics of a problem, it is a very sensitive test and will pick up on any brain or eye problem that affects your baby’s vision. 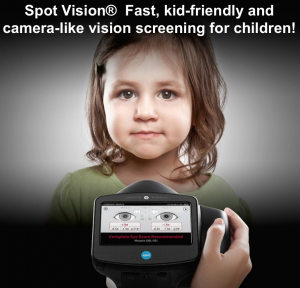 Fast, child-friendly, camera-like vision screening test for kids! Spot Vision® is a high-end optics and infrared light scanning device combined with sophisticated software, algorithms, and infrared imaging technology. This is the traditional method to assess visual acuity. We use either letters or shapes to find out how well your child can see. This is an “old-fashioned test”, but it is still effective at diagnosing vision problems in older children. We start performing this test around 4-5 years old. 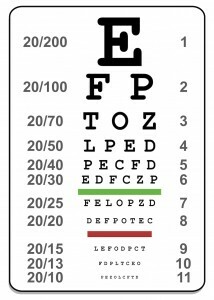 If a child has trouble communicating the images of the eye chart, then Spot Vision testing is recommended. Please talk with your pediatrician if you have more questions about these tests.